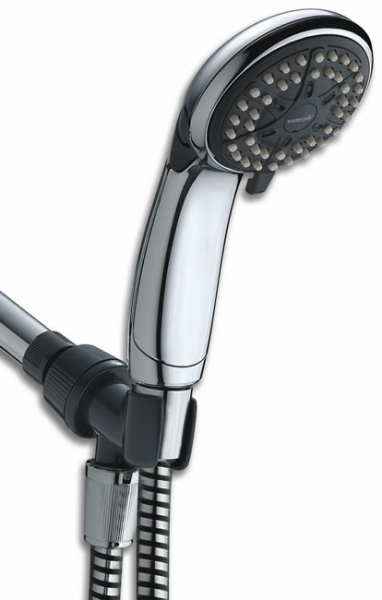 The EcoFlow handheld showerhead, Water Pik's latest innovation in eco-friendly technology, reduces water consumption and energy use while offering stylish design, 3 spray settings and a water-pause toggle to help you maximize savings. Spray modes include a concentrated center power spray, a pulsating massage and a combination of the two. Advanced OptiFLOW Technology delivers a high quality shower experience with water efficiency. Comes with a shower arm attachment and a 5' hose. Chrome finish. 1.5 gpm.